Critics of Chris Hedges’ recent attack on the Black Bloc and its role in the Occupy movement excoriated him, among other things, for mistaking a set of tactics for a specific, ideologically coherent group. Fair enough. But a closer look at what are called “Black Bloc tactics” shows that they are not tactics at all. Rather, they bear a closer resemblance to a cargo cult. What’s a cargo cult, you ask? While the term originated out of some obscure mid-century anthropological research, it has since acquired a broader meaning. It refers to any group holding a steadfast belief that ritually re-enacting certain behaviors will lead to a desired outcome, ignoring other contextual elements that could contribute to the outcome. So, for example, modern companies might adopt the dress code policies of more successful competitors in the belief that this will make them more successful. Cargo cults can be a problem in social movements too. Of course, no movement is completely original, and all borrow organizing practices from other movements. This can be a good thing, as we saw with the “general assembly” meeting model that first gained widespread visibility out of the global justice movement of the late 1990s, and re-emerged last year as a key feature of the Occupy movement. But transposing movement practices into different contexts without considering the specific historical and political circumstances in which those practices emerged can have negative consequences. In some cases, the belief can take hold that re-enacting certain practices will reproduce certain outcomes. From there, the cargo cult isn’t too far behind. Black Bloc tactics are the latest movement cargo cult, although they are far from the only one. With their trademark black outfits, their standoffs with riot police, and their willingness to engage in property destruction, practitioners of Black Bloc tactics invoke the legacy of the German and Italian Autonomen of the 1970s and 80s (whether the current-day practitioners recognize this lineage is irrelevant, as the key here is to trace the origins of the form, not the intellectual trajectories of its advocates). Amidst the social and political ferment of the 1970s, these groups built autonomous squatter communities, complete with community centers, housing services, canteens, and other resources. The original Black Blocs emerged to defend against violent police repression of the Autonomen communities. Horrified by the levels of police brutality, which hadn’t been seen since the days of the Third Reich, many Germans sympathized with the Autonomen. The attacks put the legitimacy of the state into question, so the militant and violent defense against the attacks seemed justified. But as the battles wore on, support began to wane. As the communities crumbled under the weight of state repression, the Black Blocs took on a life of their own, detached from the now non-existent communities they were set up to defend. Divorced from their social context, Black Blocs persisted as a form, or a “tactic” as it is often referred to. But it was a tactic disconnected from any broader strategic goal. And as any organizer worth their salt will tell you, you can’t have tactics without strategy. Strategy is the big-picture plan for achieving a broader goal, and tactics are particular techniques or tools used to achieve that strategic goal. Tactics are contextually specific and have measurable outcomes. If they are not effective in achieving the strategic goal, they are abandoned. So what happens when you get tactics without strategy? You get a cargo cult. Without a strategy to guide you, all that is left is a blind faith that faithfully repeating a set of tactics that worked in the past will reproduce the movements of the past. Today, as many are inspired by the vibrancy of the movement, outraged at police repression of the movement, yet frustrated by a lack of strategic options, it makes sense that some would take refuge in faithfully reproducing the tactics of the past, in the hope that it will lead to some kind of breakthrough. But of course, the political and historical context of Black Bloc tactics in Germany and Italy in the early 1970s is dramatically different than the context surrounding Black Bloc tactics in the U.S., circa 2010s. First, notwithstanding the real accomplishments of Occupy over the past several months, progressive social movements in the U.S. today are nowhere near as strong as those in the Europe of the early 70s. This is particularly the case for the U.S. labor movement, which has often formed the backbone for progressive social movements, but is currently struggling. Granted, we know from recent months that things can change rapidly, but that kind of social movement strength is not something that can be willed into being by a small group, however determined and well color coordinated, engaging in isolated bursts of militant activity. Second, and crucially related to this last point, the U.S. state circa 2012 is not experiencing the same crisis of legitimacy as the German and Italian governments of the 1970s. While many people are outraged, frustrated, and disgusted with one or both political parties, as well as various state and local legislatures, only a tiny minority at this point have gone so far as to challenge the very legitimacy of government at the federal, state, or local level. Even efforts to remove elected officials, as we are currently seeing in Wisconsin and Oakland, are being pursued through established, legal channels. Whatever one’s opinion of the matter, it is pretty clear that “smashing the state” is not yet very high on most people’s list of demands. In such a context, it is safe to assume that the police, i.e. the state’s legitimate guarantors of order, will get the benefit of the public’s doubt. Absent the most egregious brutality against unarmed, clearly peaceful protesters, the kind visited upon Iraq veteran Scott Olsen in Oakland, or the students who were pepper-sprayed at UC Davis, most people will see police actions as legitimate. The fact that most people are getting news of police actions from incomplete and/or misinformed media reports does not help matters. But isolated bursts of militant Black Bloc tactical maneuvering will not change this fact, nor will they challenge the commonly held presumption that police actions are legitimate. So, given the current context and strategic goals of the Occupy movement, how do Black Bloc tactics stack up as actual tactics? If we can assume for the sake of argument that a basic strategic goal of the Occupy movement is to build an inclusive and growing community in opposition to the greed and destructiveness of the 1%, can Black Bloc tactics help to achieve that strategic goal? It seems doubtful. Practitioners of Black Bloc tactics present themselves as the protectors of the community. But a look at the record shows that Black Bloc tactics don’t protect anyone. Granted, there have been a few daring “un-arrest” operations during protests, but these must be weighed against the many other times when Black Bloc tactical maneuvering has needlessly put movement participants in danger. 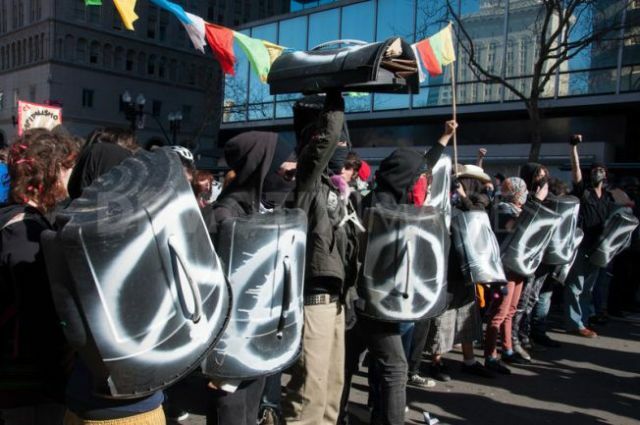 We saw this most recently in Oakland on the “Move-in Day” of January 28, when shield-wielding protesters aggravated a standoff with riot police, leading to the arrest of hundreds of fellow activists. In this, Black Bloc tactics failed in their most basic ostensible function of protecting protesters from the police. While some may object to the implication that Black Bloc tactics are at least partly responsible for the police’s brutal response, this ignores the situational dynamic that Black Bloc tactics create. There’s a saying in the Occupy movement about the riot police: “when you’re in riot gear, everything looks like a riot.” The same can be said for when you’re in Black Bloc gear. Implicit in the tactic is the inevitable standoff with the cops. Moreover, in creating a unified, organized, menacing opponent, it’s a tactic that creates terms of engagement that are very familiar to police, and easy for them to understand on their terms. With their masked faces and all-black outfits, Black Bloc practitioners offer themselves up as the camera-ready villains against whom the police can all-too-easily position themselves as the heroes taking “necessary” action. At the same time that Black Bloc tactics fail to protect movement participants, they create impediments to building an inclusive and growing movement community. Let’s be honest: there’s nothing terribly inviting about a group of black-clad, masked individuals, who bear a closer resemblance to the riot police than to their fellow activists. At best, such tactics require other movement participants to spend valuable time explaining to others that Black Bloc tactics are a peripheral part of the movement. At worst, they alienate potential supporters and make the police the central political issue, shifting attention away from the real perpetrators of social inequality, i.e. the 1%. Black Bloc tactics show little ability to advance the strategic goals of the Occupy movement, while creating barriers to movement building. Their persistence has more to do with cargo cult thinking than with strategic effectiveness. So it’s time for a rethink. Real tactical maneuvering doesn’t involve ritualized repetition of past practices. Rather, it involves linking tactics to strategic thinking about movement building. There are plenty of people active in the Occupy movement who are engaging in this kind of strategic thinking, and developing innovative tactics to pursue a collective, strategic vision. That’s where the focus of the Occupy movement should be now. I’m going to have to disagree. For one thing, I don’t equate breaking things with violence. If you think that way, then you really don’t have much conception of what violence actually is. Having your teeth kicked in is violence. A busted-up ATM is just vandalism. The Black Block is basically a bunch of kids who are angry and want to smash things. Having been screwed out of a future, they should be angry. At least they are not shooting or blowing up people. I think there is something wrong with young people who don’t want to break things. Does not breaking things help the movement? As many of my middle class co-workers point out, at least by staying in the headlines, the Black Block helps keep the message alive. Pacifism might feel good, but absent a charismatic leader like MLK (and absolutely nobody fits that description), it cannot even get off the ground. Outside the culture wars, the Left just does not speak the average American’s language. (How else can one explain the US working class refusal to support leftist ideology?) Americans are more receptive to Anarchism than government socialism, and the Right has capitalized on that fact. (The original Boston Tea Party was bottom-up vandalism.) Our cultural myths (if not the actual reality) are distrust of government, not embracing it. True, the MSM will paint the Black Block as negatively as possible to discredit the Occupy Movement, but most people who take vandalism as indicative of the actual goals of Occupy would probably never support it in the first place. Thanks, Barry. Was not my intent to be pedantic and snotty. A lot of millenial movements have a para-political content, and they often have a tinge of omnipotent thinking. Ghost Dance religion folk thought White bullets wouldn’t stop them, etc. Maybe Block Bloc should re-read “Left-Wing Communism: An Infantile Disorder” by V.I. Lenin. Sounds like Freud could have composed that title, doesn’t it? Just saw Ahmed Saleh, the famous Egyptian activist, speak in person, and he maintained that the Egyptian revolution was non-violent. This extremely strict definition of non-violence that you and Hedges seem to agree on is a totally new phenomenon. We can’t say it’s ever been successful, whereas a continuum of non-violent action has been successful more times than we can count. In any case, this “purity” push is going to be counterproductive. Despite all the Blac Bloc action this fall, the police haven’t killed anyone anywhere in the country. nonviolent action is an incredibly broad potential territory that has barely begun to be explored. it is potentially profoundly subversive, confrontive, and effective in ways that no historical practices have yet touched. physical weapons are the way of history, the way we know all too much about. the weapons of the heart, the bravery of the heart, are the way of the unknown, of invention, of now. such fighters will gather to huge nonviolent movements to come. let us ask ourselves and see and think creatively what form we want these coming actions to take. let us not waste precious energy and thought on battles we already know we cannot win. just as the methods of violence are endless in their ingenuity, the canvas of nonviolence is infinite–and hardly tested yet. we can bust open history. the world already belongs to us. FYI, I originally did include more historical description of the original cargo cults, but had to cut it for reasons of length. As for the second point, you’re absolutely right that the term can be applied to a broad range of activities by different groups. However, the focus of the article is Black Bloc tactics, which is why I apply the analogy to them. I’m a bit shocked that the writer doesn’t seem to know even where the Cargo Cult movement existed, or what it did, in order to compare is to the Black Bloc. (although it is correct to state that both think that ritual enactment of certain activities will bring about a desired result). In the area of what is now Papua New Guinea, during WW2, tribal folk saw cargo planes unload valuable stuff, and attempted to create mock airfields and planes in order for the “cargo” to magically appear, via imitative magic. Analogies to the Black Bloc are a bit thin. One can point to ritual sales of the Spartacist, or ritual denounciations of rival sectlets, or any of an array of nonproductive activities, really. I’m going to respectfully disagree with Barry. Following the publication of the Hedges piece, there was a general discussion on the Solidarity members’ listserv about the arguments Hedges made which had a range of opinions. I won’t try to recreate the other arguments, but I will say my take. I like that Barry’s piece doesn’t broadbrush and associate black bloc necessarily with anarchism; most people will have noticed that the anarchist community have been having their own discussions about black bloc for years now and published a number of responses to the Hedges piece immediately after it was released, themselves expressing a diversity of opinions. I do also like that Barry doesn’t step into the murky water of “black bloc is bad because they’re violent, we must be non-violent all the time”. Still though, I don’t agree with his approach. What I get out of Barry’s piece is that the reason why black bloc keeps coming back is because its practitioners don’t have a sense of strategy and are just trying to evoke the spirit of militant confrontation without an understanding of how that happens. The result is that black bloc damages actual, legitimate movements rather than pushing them in an intended direction. Maybe I agree that there’s a problem of a lack of strategy, but the comparison to a cargo cult seems rather condescending. I’m not saying that that’s never true; I have personally met people take that approach (“they did it and this happened, why don’t we do that?”). Considering that black bloc is an issue that’s been around for some time (it mostly pops up around summits and big demos, which I guess Occupy fits into), I think we have to take the black bloc a little more seriously. That is, let’s assume that black bloc isn’t an irrational response or stupidity, but its one response that seems to make sense based off of a larger social problem. 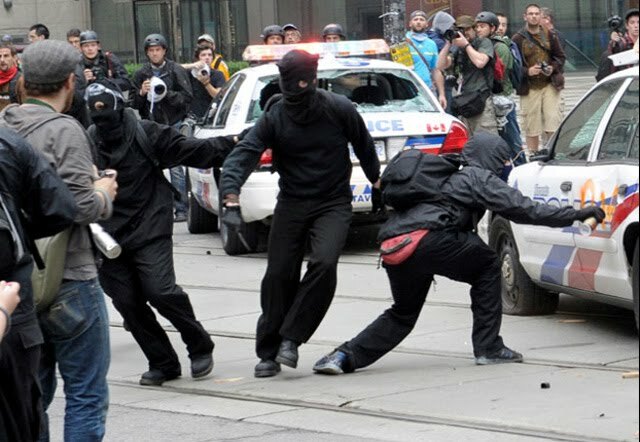 This is the approach that Clarice Kuhling, writing for the Canadian New Socialists, takes in her reflection on the Toronto G20 protests and the role of the black bloc there. What she says, in summary, is that in thinking about where these tactics come from we have to consider that militant working class activity has declined to the point of nearly disappearing, especially among trade unions who not only retreat from militant action but even work against it when it comes up among members or people in the community. The result is that there’s major frustration with pacified protests that lose over and over again, and a layer of people react in an almost cathartic fashion. And as the socialist left, I think we should consider that our attempts to work in organized labor often means that we take on some of these qualities too–conservative tactics and/or culture. Not always, of course, but its worth thinking about. One last thing, in the vein of “how do we deal with black bloc”, which is a big question, I think we have to start by taking the condition that produces black bloc seriously and think a little about tactics ourselves. There is obviously a lot to say about our own frustration as people aspiring to “build the movement” often feeling like we have to clean up after this stuff, but black bloc I think is a product of the era, which has been around for a few decades now and will probably still be in the future until we figure this out.